There were 547,300 job vacancies in Canada in the second quarter, up 87,100 (+18.9%) from the second quarter of 2017. Most of the increase was for full-time job vacancies (+74,800 or +23.2%). At the same time, the job vacancy rate rose 0.5 percentage points to 3.4%, the highest national job vacancy rate since the beginning of the series in 2015. This continues a series of year-over-year increases in both the number of vacancies and the job vacancy rate that began in the fourth quarter of 2016. The number of job vacancies in Canada (unadjusted for seasonality) was up 18.4% from the first to the second quarter of 2018. By comparison, vacancies rose 18.8% from the first to the second quarter of 2017, and 19.1% from the first to the second quarter of 2016. This is consistent with the seasonal pattern observed during this period in the unadjusted employment data from the Labour Force Survey (LFS) and the Survey of Employment, Payrolls and Hours. Both the number of job vacancies and the job vacancy rate increased in nine provinces in the second quarter, led by Quebec and British Columbia. The job vacancy rate reached its highest level since the beginning of the series in six provinces—Prince Edward Island, British Columbia, New Brunswick, Ontario, Quebec and Manitoba. At the same time, there was little change in the number of job vacancies and the job vacancy rate in Saskatchewan and the territories. The number of job vacancies was up 32,600 (+38.9%) in Quebec compared with the second quarter of 2017, the eighth consecutive quarter with a year-over-year rise in the number of job vacancies in the province. Almost all sectors recorded increases, with health care and social assistance (+5,100 or +60.3%) and manufacturing (+5,100 or +44.0%) contributing the most to the rise. At the same time, the job vacancy rate increased 0.8 percentage points to 3.2%. Employers in British Columbia reported 19,900 (+23.2%) more job vacancies compared with the second quarter of 2017, driven by increases in accommodation and food services (+3,900 or +24.9%), construction (+3,700 or +45.8%) and retail trade (+2,900 or +28.5%). Over the same period, the job vacancy rate rose 0.7 percentage points to 4.7%, tied with Prince Edward Island for the highest rate among the provinces in the quarter. There were 19,700 (+10.6%) more job vacancies in Ontario than in the same quarter one year earlier. Health care and social assistance (+7,800 or +46.0%) and administrative and support services (+4,500 or +27.7%) contributed the most to the increase. At the same time, the number of job vacancies declined notably in accommodation and food services (-3,500 or -13.8%) and finance and insurance (-1,400 or -11.3%). From the second quarter of 2017 to the second quarter of 2018, the job vacancy rate rose 0.3 percentage points to 3.3% in Ontario. Job vacancies were up 9,000 (+17.7%) in Alberta in the second quarter, led by health care and social assistance (+2,500 or +67.6%) and transportation and warehousing (+2,200 or +103.8%). The job vacancy rate rose 0.4 percentage points to 3.0%, the sixth consecutive quarter with a year-over-year increase in the job vacancy rate. Among the smaller provinces, New Brunswick reported 1,800 (+20.8%) more job vacancies in the second quarter, due entirely to gains in full-time job vacancies. The increase was driven by accommodation and food services (+700 or +71.4%) and manufacturing (+400 or +23.6%). Over the same period, the job vacancy rate in the province increased 0.6 percentage points to 3.6%. According to the LFS, the unemployment rate in New Brunswick decreased 0.6 percentage points to 7.6% from the second quarter of 2017 to the second quarter of 2018. The number of job vacancies was up 600 (+28.5%) in Prince Edward Island and the job vacancy rate in the province increased one percentage point to 4.7%. Along with British Columbia, this was the highest job vacancy rate among the provinces for the quarter. In the second quarter, 46 of the 69 economic regions recorded year-over-year growth in job vacancies, led by Capitale-Nationale, Quebec (+65.0% or +5,100), Camrose–Drumheller, Alberta (+62.2% or +1,100) and Estrie, Quebec (+54.6% or +1,600). In both Capitale-Nationale and Estrie, the increase was driven by sales and service occupations as well as occupations in trade, transport and equipment operators. The growth in Camrose–Drumheller was driven by occupations in trades, transport and equipment operators. In the same quarter last year, 43 economic regions recorded year-over-year growth in job vacancies. In contrast, the number of job vacancies fell in two economic regions over the same period. The decline in Annapolis Valley, Nova Scotia (-25.3% or -400) was driven by sales and service occupations. The number of job vacancies also decreased in Southeast, Manitoba (-20.6% or -200). In the second quarter, 32 economic regions had a higher proportion of full-time job vacancies than the national average (72.5%). 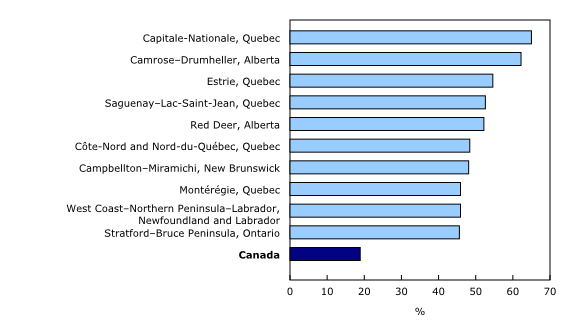 Côte-Nord and Nord-du-Québec, Quebec had the highest proportion of full-time job vacancies (86.6%), followed by Banff–Jasper–Rocky Mountain House and Athabasca–Grande Prairie–Peace River, Alberta (84.8%), Chaudière–Appalaches, Quebec (83.5%) and Northeast, British Columbia (82.7%). Meanwhile, the lowest proportion of full-time job vacancies was in Southwest, Manitoba (54.7%), followed by Camrose–Drumheller, Alberta (55.9%) and Kingston–Pembroke, Ontario (56.5%). The national average proportion of job vacancies for which the minimum level of education sought was post-secondary below the bachelor's level (such as a college, CEGEP, apprenticeship or trade certificate or diploma) was 21.7% in the second quarter. However, it was 36.6% in Southwest, Manitoba, the highest among all economic regions, followed by North Coast and Nechako, British Columbia (34.4%), Centre-du-Québec, Quebec (32.0%) and Mauricie, Quebec (31.6%). In the second quarter, the proportion of job vacancies for which the level of education sought was a university certificate or diploma at the bachelor's level or above was 14.2% in Canada. 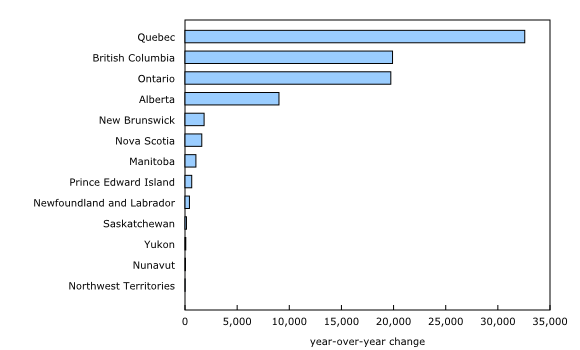 It was the highest in Montréal, Quebec (25.1%), followed by Toronto, Ontario (23.3%) and Avalon Peninsula, Newfoundland and Labrador (21.1%). The highest average offered hourly wage for vacancies in the second quarter was in Wood Buffalo–Cold Lake, Alberta ($28.65), followed by Northeast, British Columbia ($26.75), Nunavut ($26.20) and Toronto ($23.50). According to the wage component of the Job Vacancy and Wage Survey, Wood Buffalo–Cold Lake was also the economic region with the highest hourly wage paid to full-time employees in both 2016 and 2017. Meanwhile, the lowest average hourly wage for vacancies was in Prince Edward Island ($14.40), Annapolis Valley, Nova Scotia ($14.95), Moncton–Richibucto, New Brunswick ($15.40) and Cape Breton, Nova Scotia ($15.70). Of the economic regions with the lowest average offered hourly wage for vacancies, most were in the Maritimes. Job vacancies were up in 8 of the 10 broad occupational categories in the second quarter, with the largest increase in trades, transport and equipment operators, followed by sales and service occupations. Over the same period, the number of vacancies declined in art, culture, recreation and sport occupations and was little changed in management occupations. Job vacancies in trades, transport and equipment operators grew by 29,100 (+39.7%) on a year-over-year basis. Full-time job vacancies accounted for 94.7% of the rise. Increases were observed in many of the more detailed occupational groups within this broad category, mainly motor vehicle and transit drivers (+8,500 or +48.0%) and trade helpers and labourers (+3,800 or +39.1%). Job vacancies in trades, transport and equipment operators were up in nine provinces, led by British Columbia and Quebec. There were 21,300 (+12.8%) more job vacancies in sales and service occupations compared with the second quarter of 2017, with the rise concentrated in Quebec and British Columbia. Full-time job vacancies accounted for 86.6% of the increase. Notable rises in vacancies were observed for retail salespersons (+6,400 or +29.4%) and food counter attendants, kitchen helpers and related support occupations (+4,100 or +14.2%). At the same time, a notable decline in vacancies for cashiers (-3,000 or -33.7%) moderated the overall increase in this broad occupational group. The average offered hourly wage for vacant positions in sales and service occupations was up 9.2% to $14.80. Among the provinces, the highest average hourly wage growth rate for this broad occupational group was in Ontario (+16.7% to $15.70). This increase coincided with a notable rise in Ontario's minimum wage at the beginning of 2018. 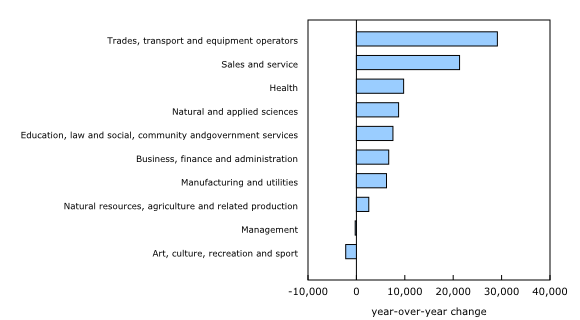 In contrast, job vacancies were down 2,200 (-15.4%) in art, culture, recreation and sport occupations. This was the first year-over-year decline in job vacancies for this broad occupational group since the second quarter of 2016. The decrease was mostly attributable to fewer vacancies for athletes, coaches, referees and related occupations in Ontario. The Job Vacancy and Wage Survey (JVWS) provides comprehensive data on job vacancies and wages by industrial sector and detailed occupations for Canada, the provinces, territories and economic regions. Job vacancy and offered wage data are released quarterly. The annual wage data for 2017 were released on June 26, 2018. The National Occupational Classification (NOC) is a four-tiered hierarchical structure of occupational groups with successive levels of disaggregation. The structure is as follows: 1) 10 broad occupational categories, also referred to as one-digit NOC; 2) 40 major groups, also referred to as two-digit NOC; 3) 140 minor groups, also referred to as three-digit NOC; and 4) 500 unit groups, also referred to as four-digit NOC. Improvements were made to the occupation coding procedures starting in the second quarter of 2017. This has resulted in a decrease in the number of vacancies for which the occupation is unclassified. The new coding procedures do not affect the total number of vacancies, but may affect estimates by occupation. With the release of data for the first quarter of 2018, the geographical classification was updated to the Standard Geographical Classification (SGC) 2016. Estimates from the first quarter of 2015 to the first quarter of 2018 are based on the SGC 2011. With the release of data for the second quarter of 2018, the JVWS will start using the North American Industry Classification System (NAICS) Canada 2017 Version 2.0. 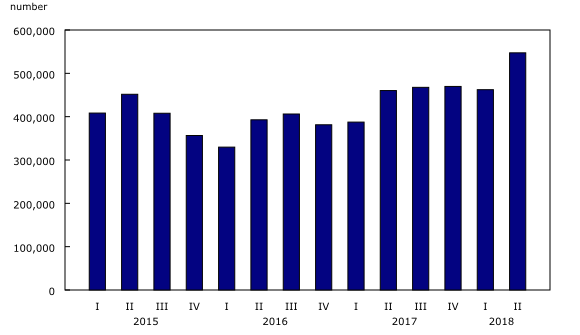 Industry estimates before the second quarter of 2018 are based on the 2012 NAICS. The NAICS has 20 industrial sectors at the two-digit level in both versions of the industry classification. Job vacancy data from the JVWS for the third quarter will be released on January 9, 2019. To enquire about the concepts, methods or data quality of this release, contact Dominique Dionne-Simard (613-618-9411; dominique.dionne-simard@canada.ca) or Client Services (toll-free: 1-866-873-8788; statcan.labour-travail.statcan@canada.ca), Labour Statistics Division.